The Upper Ocean Dynamics Laboratory (UODL), conducts a spectrum of experimental studies of coastal circulation processes and ocean-atmosphere interactions during hurricane passage. One important focus is to understand the role of the upper ocean on sudden hurricane intensification changes using a combination of satellite (radar altimetry), aircraft and in situ measurement and analysis techniques such as operational oceanic heat content product suite for hurricane intensity forecasting. Personnel are involved in various aspects of the NOAA Hurricane Research Division Hurricane Field Program each year deploying oceanographic and atmospheric sensors such as profiling floats and expendables from USAF WC-130s and NOAA WP-3Ds. This airborne oceanographic component in the laboratory, only a few exist worldwide, was recently involved in mapping the Loop Current and eddy field during the Deep Water Horizon oil spill as well as involvement in international field programs addressing weather and climate variability. A second focus of the laboratory is the operation of High Frequency Radars (HFR) to map the real time surface currents, winds and waves. Currently, the laboratory has three radars operational with a fourth radar to be deployed in North Key Largo in the near future in the South Florida footprint. These radars, working 24/7, provide data to the HFR national network to measure the energetic, and oft-trecherous Florida Current through the Florida Straits. 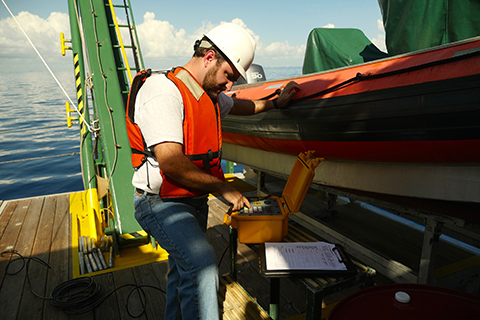 In addition to providing valuable data for student research topics, these real time measurements address a spectrum of societally relevant issues related to the coastal ocean on : search and rescue operations by the United States Coast Guard; ship tracking by the Department of Homeland Security; dispersion of toxins such as harmful algae blooms in the surface layer (e.g., beach closures); predicting and mitigating the effects of an oil spill (e.g., Deep Water Horizon); improving storm surge and inudation models; providing data to improve rip current predictions; and linking fisheries and biological data to coastal ocean circulation processes. The program is supported by the Southeast Coastal Ocean Observing System Regional Association which is sponsored by NOAA's Integrated Ocean Observing System Program. UODL provides a forum for scientists, students and local communities with critical resources relevant for the continued state-of-the-art study of tropical storms and their impacts on coastal ocean circulation. With three decades of solid research experience, scientists and students exchange ideas with common interests in these highly relevant societally relevant themes.